With engines going electric and alternative fuel sources growing in popularity, the eco-friendly green wave has fully engulfed the car industry. But the engine is only one part of the car. A major component that requires replacing is the humble tire. Tire manufacturers are using three main methods to do their part in saving the environment and making eco-friendly tires. The first key component to an eco-friendly tire is the raw material used. Companies are attempting to replace rubber with a synthetic blend, often incorporating silica. Silica can not only help replace rubber in the treads, but reduces road friction – which we’ll come back to in a moment. The construction of the tire, from treads to sidewalls, is also important in keeping the tire green. Stiffer sidewall construction reduces the heat generated by the tire, which contributes to the tire’s longevity. Aside from rubber, companies are also investigating ways to reduce the amount of petroleum used in creating a tire. Between 5 and 10 gallons of petroleum oil are used to make a single tire, which the industry has been trying to cut back or eliminate for more than 20 years. Making synthetic rubber is also hard on the environment, leading manufacturers to try to cut synthetic rubber usage in half. Carbon black is used as filler for treads, though as mentioned, silica is more and more prevalent as a replacement. More sustainable plant-derived materials are making headway as substitutes for a variety of tire components,, such as sunflower oil in lieu of petroleum and flora-derived latex replacing rubber. Even oil derived from orange peels has been used in place of more toxic chemicals. As mentioned, silica helps reduce rolling resistance, or the energy loss as the tire deforms against the road. Conserving energy also increases fuel efficiency. Rolling resistance accounts for 10-15 percent of fuel consumption in passenger cars, but can be as much as 30 percent of fuel usage in large trucks. While low rolling resistance tires may only reduce that by 2 to 3 percent, it’s still fuel savings – not only helping the environment, but your wallet, as well. Keeping your tires inflated near the recommended inflation level, it should be noted, can also help in saving fuel. The second benefit, a byproduct of how efficient the car is running, is reduced CO2 emissions. Low rolling resistance tires have improved significantly since they were introduced, providing good all-around performance, and most manufacturers offer low rolling resistance tires. The tread itself – often a proprietary pattern unique to a manufacturer – makes a great deal of difference how quickly a tire will wear down. For example, a winter tire used in summer will wear down quickly. The tire composition and tread are not made for summer driving, and will be rendered unusable much faster than if used in colder conditions. As noted above, materials used also contribute to the tire’s lifespan, and what goes into treads can also help leave less proverbial rubber on the road. As tread patterns continue to develop, and what the treads are made of improves, tires will see better rolling resistance and less wear, with better durability and longevity–meaning longer times between replacements. Fewer replacements directly equates to fewer tires needed, cutting down on materials needed for manufacturing. Let’s look at an example of how construction, rolling resistance, and durability go into making a tire. 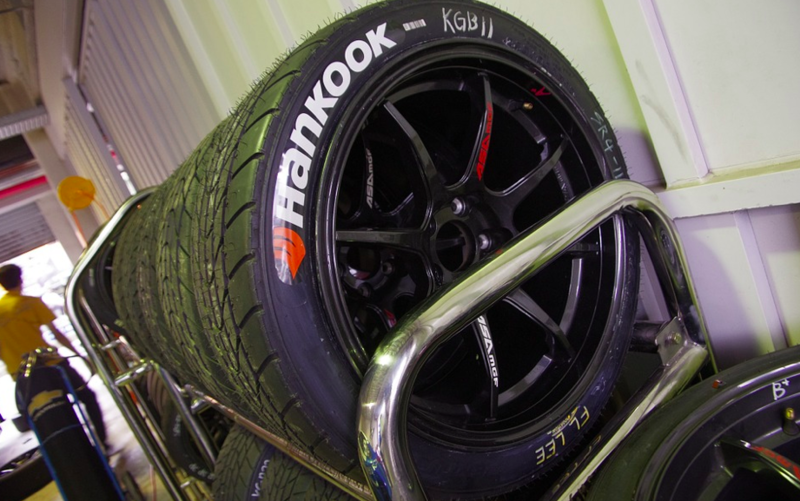 Hankook tires feature the company’s “Kontrol technology,” introduced in 2008. The aim is to improve “performance, safety, and comfort,” but also make eco-friendly tires. The “k” in “Kontrol” stands for “kinetic,” the company says, which ties into rolling resistance. Not only is Hankook focused on reducing what it calls rotational resistance, but they use silica in their treads. The eco-friendly materials used does not stop at silica, however, as Hankook is replacing oil byproducts like synthetic rubber, carbon black, and synthetic oil. On top of making the tire itself eco-friendly, Hankook is making the process of manufacturing better, by purifying water contaminants produced as byproducts and minimizing greenhouse gas emissions. They, like other manufacturers, work hard to ensure that eco-friendly does not mean a sub-par tire, focusing attention to how the tire vibrates, how it grips the road and how it wears, and even how much noise the tire produces. Tire companies are cutting down on using materials harmful to the environment, while reducing friction, thus increasing fuel efficiency. As a result of less fuel used, CO2 emissions are also reduced, and the car becomes greener. With less wear on the tire, durability and longevity is extended, meaning fewer trips to replace tires. Tire manufacturers don’t have to produce as many tires, saving materials and the energy needed to create the tires. In the end, manufacturers can provide high-quality, eco-friendly tires.